In their latest article, Kirkland RV informs RV owners and prospective RV buyers about a tool that can be utilized to determine the value of an RV. After all the information is inputted, NADA guides will provide the suggested list price, and the low and average retail price of the RV. 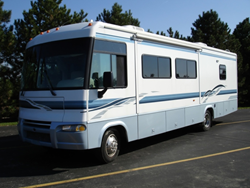 For RV owners looking to sell a vehicle, or for prospective RV owners looking to buy, determining the value of an RV can be a difficult and complicated task. In Kirkland RV’s latest article, the new and used RV dealership reveals a tool to help owners and buyers determine an RV’s value. What does this mean for prospective RV buyers and sellers? A special NADA RV pricing guide, available in the article, is a tool that gives consumers the ability to enter the make, model, and year of their RV to find its marketable value. This special NADA tool is particularly helpful for RV owners looking to sell their vehicle. Without having to guess at a price range or needing to worry about setting the wrong price, RV owners can simply enter their vehicle’s information and get a proper price range. For buyers considering several different RVs, this tool can also help them to find the ideal vehicle. All buyers must do is input their information into the NADA’s pricing guide. The article states, “After all the information is inputted, NADA guides will provide the suggested list price, and the low and average retail price of the RV.” The article gives further clarification about the tool and its features. Buyers that are looking for a selection of new and used RVs at great prices should view Kirkland RV’s wide selection of quality vehicles. For more information visit their website at http://www.kirklandrvs.com.